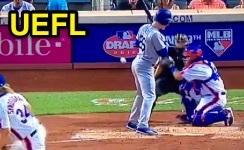 HP Umpire Adam Hamari ejected Mets P Noah Syndergaard for throwing at Dodgers 2B Chase Utley and Mets Manager Terry Collins for arguing Syndergaard's ejection in the top of the 3rd inning of the Dodgers-Mets game. With one out and none on, batter Utley took a first-pitch fastball from Syndergaard for a called first ball. Replays indicate the pitch, a 99-mph fastball, was thrown behind Utley and waist high (px 3.312, pz 3.877), the call was irrecusable. At the time of the ejection, the game was tied, 0-0. This is Adam Hamari (78)'s first, second ejection of the 2016 MLB regular season. Adam Hamari now has 7 points in the UEFL Standings (1 Previous + 2*[3 AAA + 0 QOCU] = 7). Crew Chief Tom Hallion now has 9 points in Crew Division (7 Previous + 2 Irrecusable Calls = 9). These are the 62nd and 63rd ejection reports of the 2016 regular season. This is the 32nd player ejection of 2016. Prior to ejection, Syndergaard's line was 2.1 IP, 2 H, 0 R.
This is the 25th Manager ejection of 2016. This is New York's 3rd ejection of 2016, T-1st in the NL East (MIA, NYM 3; WAS 2; ATL 1; PHI 0). This is Noah Syndergaard's first career MLB ejection. This is Terry Collins' 2nd ejection of 2016, 1st since May 14 (Carlos Torres; QOC = N [Foul/HBP]). This is Adam Hamari's first ejection since August 23, 2015 (Adrian Beltre; QOC = Y [Balls/Strikes]). Wrap: Los Angeles Dodgers vs. New York Mets, 5/28/16 | Video available via "Read more"